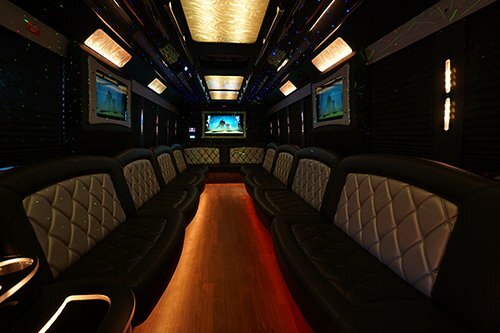 This is just a little bit smaller than our 34 passenger party bus but very similar in features that it has. 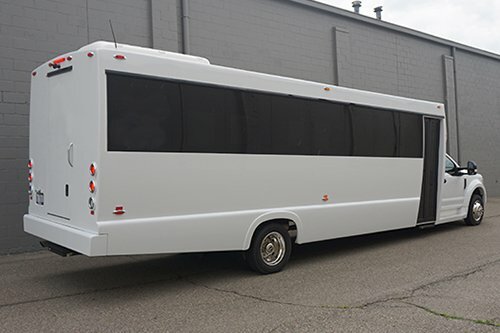 It is a white exterior bus that is perfect for weddings or other events. The interior is black/gray/and white and made out of custom stitched leather. There is also mirrored ceiling panels throughout the bus. The lights in the bus are LED RGB lights which change color to any color in the rainbow and do some different light shows. For keeping your drinks cold we offer two custom bars with durable granite tops that have coolers in them. We fill the coolers with ice for you as well as stock the bus with cups.